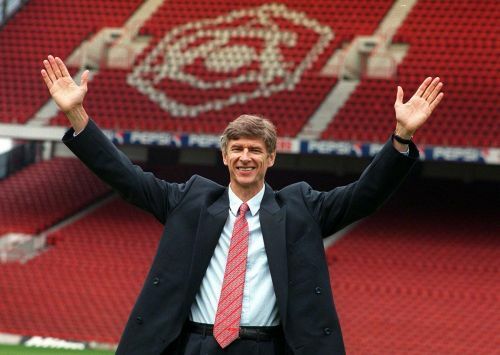 Arsene Wenger took charge of Arsenal from the 1st of October 1996. As Arsenal manager Arsene Wenger signs off his remarkable 22 years at the helm, we look back at some iconic moments which football fans will forever cherish especially the ones on the red side of North London. When Arsene Wenger replaced Bruce Rioch as Arsenal Manager in September 1996, the newspapers welcomed him with the headlines “Arsene Who?”. An unknown man coming from a club like Nagoya Grampus in Japan did not have many expectations from the Gooners faithful. The Frenchman revolutionized the style of English football as he proved that skill & flair could flourish despite the rough & tough nature of the league. He transformed Arsenal from the ‘boring boring Arsenal’ to a free flowing side playing attacking football. The squad had an aging defence at the wrong side of 30 led by the captain Tony Adams, Lee Dixon, Nigel Winterburn & Steve Bould. He added years to their footballing careers and also helped inspirational captain Tony Adams with his personal problems. Wenger had a unique approach to training sessions and also took steps to change the drinking culture that afflicted Arsenal. He brought on a change in the diet by encouraging boiled chicken over red meat and also discouraged the consumption of Mars bars before a game. He brought in players like Nicolas Anelka, Emmanuel Petit & Gilles Grimandi who played crucial roles to lead Arsenal to the title in 1998. By beating Newcastle United in the 1998 FA Cup Final, Wenger became the first foreigner to win the double. Wenger became known for signing young talents and giving them opportunities to nurture their talents & ply their trade in England. Nicolas Anelka, Patrick Vieira, Thierry Henry all came in relatively early on in their careers and succeeded, especially the latter two under Wenger. The philosophy of relying on youth was seen during Wenger’s entire tenure which has resulted in unearthing some gems.